Precision Electric is now listed as one of the Top 3 Electricians in Milton, providing consistent high quality in the electrical business. The ThreeBest Rated team approved the Precision Electric business listing using a 50-Point Inspection which includes everything from checking reputation, history, complaints, ratings, satisfaction, trust and cost to general excellence. You can view our listing by clicking on the ThreeBest logo to the right. 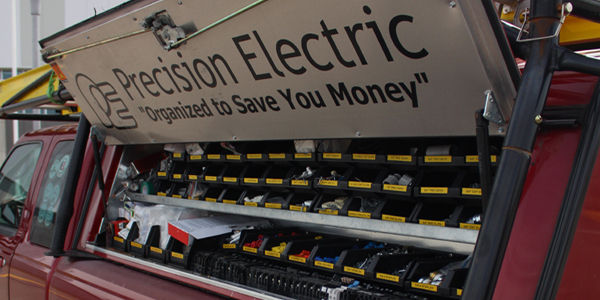 Precision Electric Testimonials - Your satisfaction is our future! Here are a few testimonials from our clients that were inspired by Precision Electric. Short quotes from happy customers are much appreciated and we thank everyone for taking the time to express their opinions. We are always looking forward to making new friends. Feel free to use one of the following links to add a review and let others know about your experience. It's very quick and easy. We have recently used Precision Electric for our business and our home. Scott and his team are wonderful to work with. They pride themselves in their extensive knowledge of code and safety concerns. Their rates are reasonable and they show up for appointments on time and complete the work according to their estimate. I would not hesitate recommending them to any of my friends or clients. Hired Scott and his crew to install and inspect wired smoke/co2 alarms at my rental property in St. Catharines. From the get go they were very efficient, punctual and organized. They explained everything that needed to be done, organized the ESA inspector and made sure my building is 100% in compliance with our local fire code giving me great piece of mind. For these reasons, I'd highly recommend the services of Precision Electric. Scott wired up my basement renovation and everything went better than expected. He was always on time, called when he said he would call, did great work and provided excellent customer service. He made useful suggestions that I incorporated into the reno. He and Pat are very friendly and helpful. When I needed two small changes after-the-fact, again he was responsive and quick. Highly recommend! My Father's house had a very complicated electrical problem. Scott worked with Milton Hydro and coordinated all the parts of the repair. He communicates well, does a great job, and is reasonably priced. I would definitely recommend him. Very pleased with the aluminum retrofit completed in my home. Definitely goes above and beyond - great service. Everything explained. Would not hesitate to recommend Precision Electric for any work you need done. A great contractor to work with. Very prompt, courtesy service and excellent workmanship. I would highly recommend them! Tidy & clean, 23 new fixtures/new outlets/new panel/new circuits etc., etc., all done with an 8 month old baby in the house --- amazingly no disruption!!! Transparent pricing, very professional. We highly recommend. Thanks guys. Great work, great price, the right person for the job. Did an awesome job on our aluminum retrofit. Great communication, very professional, left my house tidy and clean. Even came in under the price quoted - definitely a 5 star rating!! Great job done in our home. We lost power in 90% of our kitchen, plus several outlets in the dinning room and living room. Scott also put our dishwasher in a new feed. Thank you. Did a great job on the electrical part of our basement. Was courteous and professional and explained all their work. Would recommend to anyone in the area. Website Designed by Home and Small Business Computer Services Inc.